During the past few weeks, I have been watching many headlines, debates, misinformation, misrepresentation of facts as well as self-congratulatory statements by some members of the delegation that went to Geneva, to participate in the 40th session of the Human Rights Council where the High Commissioner for Human Rights Michelle Bachelet presented the Report on Sri Lanka as requested by the Human Rights Council. As the person who held the portfolio of Foreign Affairs when the Resolution 30/1 of October 1, 2015, was adopted, I feel that it is my duty to respond to some of the malicious arguments being made and misrepresentation of facts. I saw some statements claim that the initial delegation to the Human Rights Council’s 40th session in March 2019, was changed. This, like most of the reports attempting to mislead the public, is false. There is also an abundance of gossip about the delegation and undignified attacks against devoted public servants. Contrary to what is being said, there were no plans to send anyone to Geneva originally for the 40th session as we have a competent, experienced, respected diplomat as our Ambassador to the UN in Geneva, who is well-versed in procedure and substance and who has always managed things in a professional and dignified manner, based on instructions, with no attempts to blow his own trumpet like some do. And unlike some others who held this post earlier, the present Ambassador is completely apolitical with no hidden agenda to embarrass the government of the day or our country. Initially I thought that the diplomatic event at the 40th session of the Human Rights Council would be a show of Sri Lanka’s diplomatic maturity, skill, finesse and grace in handling matters rationally on the international stage. After all, Sri Lanka’s position in the world, its global recognition as a trusted partner and sovereign nation is an issue of critical importance to us all. And what could be more important today, 10 years after the end of a brutal fratricidal conflict? What could be a better opportunity to showcase our democracy especially after a tilt towards autocracy was defeated by the people, by Parliament and by the Judiciary? Indeed, the 40th session was an opportunity to tell the world of our difficult yet committed journey towards strengthening democracy, reconciliation, sustainable peace and achieving equitable economic development and prosperity for all. What I had hoped to see therefore was a serious, compassionate, and well-informed discussion on true reconciliation. What we see from many in our political spectrum – from those holding the highest positions to those in obscure positions – is a plethora of contradictory, improvised and exaggerated accounts. So much so that it is difficult to discern which is the most notorious of these utterances, or the most embarrassing, as each appears to want to outdo the other. Some managed to reduce their participation in the most important human rights forum in the world to self-important, gossipy, exaggerated tales about their supposed heroic roles in correcting the UN High Commissioner for Human Rights, the former Chile President Michelle Bachelet who has been a Defence Minister in her country, and the chief of UN Women, the foremost global institution on women’s rights. But, let’s focus on the biggest misrepresentation of them all: the version that Sri Lanka has somehow managed to produce an accusation against itself. A tale disseminated by members of the delegation that went to Geneva to participate in the Human Rights Council session. This is a tale of self-incrimination or incompetence because if these gentlemen talk today of their heroic exploits stopping the impetus of the world, how did they manage then to ensure that the Resolution passed without a vote, by consensus, and with our co-sponsorship? And why did they, at substantial cost to our coffers, celebrate by hosting a reception after the adoption of the Resolution? A similar rollover was co-sponsored in 2017, and signed by the then Permanent Representative of Sri Lanka to the UN in Geneva, the present to the Foreign Affairs Ministry Secretary, who was himself a member of the delegation this time. When he signed to co-sponsor Resolutions in 2015 and in 2017, he was not made to bear the indignity of accusations being levelled at the present Ambassador of betraying our nation and its defence forces. The decision to request for a technical or procedural rollover this year was taken after consulting both the President and the Prime Minister in February 2019, ahead of the organisational meeting of the 40th session of the Human Rights Council on February 16, 2019. Instructions pertaining to co-sponsorship were merely conveyed to Sri Lanka’s Permanent Representative to the UN in Geneva, Ambassador A.L.A. Azeez by Mano Tittawella, Secretary-General of the Secretariat for Coordinating Reconciliation Mechanisms (SCRM) which comes under the Prime Minister’s Office. The SCRM was formed by the Cabinet of Ministers in 2016, for the overall coordination of reconciliation activities including implementation of Resolution 30/1. Foreign Affairs Minister Tilak Marapana was also fully aware of these instructions which were conveyed by him to Ambassador Azeez as well. Minister Marapana had also asked Ambassador Azeez to coordinate matters with respect to the Resolution with Tittawella and had kept his Ministry Secretary Ravinatha Aryasinha informed. So, what does a rollover or procedural extension mean exactly? It means that instead of the world castigating Sri Lanka, as so often happened before January 2015, for human rights violations and impunity, the world reiterated its confidence that Sri Lanka is a nation which is firmly on the road towards reconciliation. The world reaffirmed that Sri Lankans are a responsible, mature, dignified people determined to work on tackling difficult issues to provide truth, justice, and reparation to the nationaimed at healing, upholding the rights of all and establishing the rule of law to ensure the non-recurrence of conflict, ushering in stability required for economic growth, development and prosperity for all in the long-term. A rollover of a Resolution is not a sanction in any way. I challenge any member of the delegation that went to Geneva and participated in the rollover of the Resolution without a vote, to show what sanction is contained in Resolution 40/1, or in Resolution 30/1, which is the original one, adopted on October 1, 2015. Resolution 30/1 which Sri Lanka co-sponsored in 2015, in pursuance of the mandate that President Sirisena received from the voters to implement the 100-Day Programme and take charge of Sri Lanka’s sovereign right to solve its own problems locally, is no more and no less than a historic agenda to ensure durable peace and reconciliation in our country. Contrary to what is often being said, the content of Resolution 30/1 was based on Sri Lanka’s own proposals for truth seeking, justice, reparation, and guarantees of non-recurrence presented to the Human Rights Council by me on behalf of the Sri Lanka government on September 14, 2015. The content of this Statement was both discussed and approved by the President as well as the Prime Minister at meetings that were held following the swearing-in of several ministers including me by the President after the parliamentary election held on August 17, 2015. It is as a result of this Resolution (30/1) that prospects for international action initiated through Resolution 25/1 of March 2014 and the OISL (OHCHR Investigation on Sri Lanka) that was adopted during President Rajapaksa’s regime was effectively halted. It is important to remind everyone that it is if we, as a responsible and sovereign nation fails to act that we place our citizens in grave peril because the message we then send out to the world is that we are unable or unwilling to do our job. If we fail to deal with our issues ourselves, then others will step in, and international action as well as universal jurisdiction will apply. I must recall here that following the adoption of Resolution 30/1, the President convened at least two rounds of an All-Party Conference regarding implementation of the Resolution for reconciliation while even at that time, expressing reservations regarding the involvement of foreign judges. In order to broaden the scope of implementation of the Resolution, the President sought the views of all political parties that participated in the All-Party Conference. However, some of the political parties including the members of the so-called Joint Opposition that go around the country making unfounded accusations did not even bother to give written observations or suggestions at the time. If you look at the content of Resolution 30/1 carefully, you will understand the objective of the reconciliation agenda which contains a series of measures covering reconciliation, rule of law, security and confidence-building. 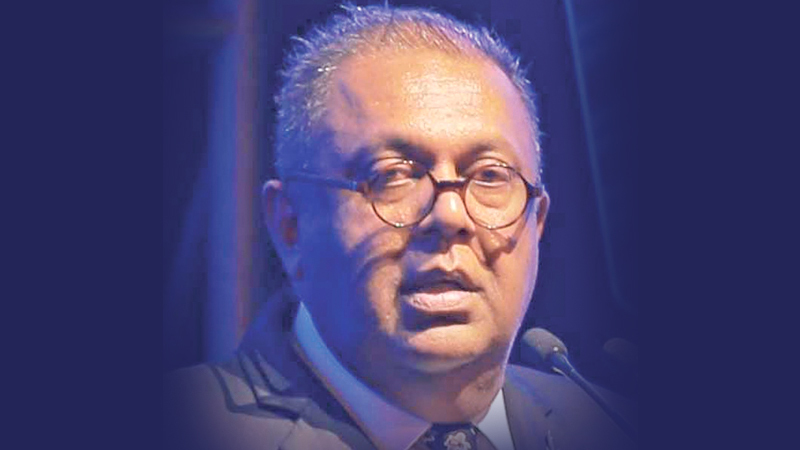 All these are measures that were derived directly from our promises to the Sri Lankan people at the election of January 2015: that we would overcome hate, that we would overcome arbitrariness, that we would overcome fear– all conditions that are necessary for long-term development of our nation. Nothing more and nothing less. Many of these measures have been implemented, and in some others the progress has been partial but is ongoing. Every citizen that has not been living under a rock, or under the rock of prejudice, will recognise those measures that include: creating institutions to ensure the rights of victims as well as the future safety, security and wellbeing of all citizens; constitutional reform, so that we can all live, work, and prosper together in dignity; addressing shortcomings so that everyone can enjoy peace in their own lands and houses. * The creation of an Office for Reparations, which has been approved in Parliament and which has passed constitutional muster, to ensure that all the persons affected by conflict have a fair opportunity to rebuild their lives, to receive adequate reparation, to be recognised in their dignity as human beings and citizens to receive appropriate satisfaction. The Office will be a permanent mechanism that will formulate policy which can help all citizens even in unfortunate events in future. What is threatening about helping those who suffer to rebuild their lives? Is it not a state’s sovereign responsibility to help all citizens in need rebuild and restore their lives and livelihoods? * The establishment of a Truth and Reconciliation Commission (for which a Concept Paper is before the Cabinet of Ministers) that will clarify the events of the conflict, including those most disputed and controversial, in order to lift the veil of secrecy and speculation, and to listen to all the victims and survivors, in a compassionate and dignified way. Everyone can tell their story. This includes the military. Who is afraid of letting our brothers and sisters from all walks of life, from all parts of our nation, speak, to enable truth-seeking, and thus facilitate measures for healing and non-recurrence of such grievous hurt in our land? Who is afraid of truth seeking to such an extent as to oppose such a local exercise by calling it some conspiracy or international intervention? Is truth a foreign concept for Sri Lankans who are blessed by the teachings of Gautama Buddha, the Vedas, Prophet Mohammed and Jesus Christ? * The establishment, within our national legal system, of “a judicial mechanism with a special counsel to investigate allegations of violations and abuses of human rights and violations of international humanitarian law”, a mechanism that the Resolution explicitly calls “a Sri Lankan judicial mechanism”not an international one, in which there would be the participation of foreign jurists. * This proposal is not to establish a foreign mechanism in some foreign land outside Sri Lanka. Literally, it is a proposal to establish a Sri Lankan local mechanism. And the participation of foreign jurists is in no way a strange or unheard-of practice in Sri Lanka. After all, it was the government led by former President Mahinda Rajapaksa which established the International Independent Group of Eminent Persons (IIGEP) in 2005, led by no less than the 17th Chief Justice of India, the illustrious justice Bhagwati. This is not the only instance either. Moreover, several Sri Lankan jurists have participated as judges and investigators in international courts. Some of our former judges and officials of the Attorney General’s Department have been appointed to judicial bodies in Fiji, as well. * No provision in our Constitution requires judges serving in our system to have Sri Lankan nationality. Of course, some could argue that the Constitution should clarify that point explicitly, but is this something we should get caught up arguing about and toss reconciliation out of the window just out of a newly discovered antipathy for the word “foreign”? * The Resolution says that the Sri Lankan justice system must investigate and adjudicate on allegations of the most serious human rights violations. Now who could oppose that? Even the gentlemen who went to Geneva this time in March 2019 say precisely that. Let’s assume that it is because of this fundamental agreement that they did nothing to prevent the adoption by consensus of the Resolution! Should we not acknowledge the need to investigate allegations? Are we not bound by our own Constitution to provide for the equal protection of the law? Shouldn’t we do justice to all our citizens including our security forces personnel by investigating allegations so that those who may not be guilty of a crime do not have to carry the weight of an allegation with them to the grave? Should we let allegations remain without investigations and make our security forces personnel vulnerable to be subjected to universal jurisdiction? Do we not owe our institutions of the Army, the Navy, the Air Force and the Police the right to justice just as much as we owe all our citizens who have been wronged? This is called abiding by our own Constitution. Nothing more, nothing less. * The participation of foreign experts, in the capacity that we decide, within our national system is nothing new or controversial. We have already done it in the past. Instead of making this a Manichean discussion of “yes” and “no”, let’s have a practical discussion of how, and in what way do we ensure that justice tackles the most serious allegations, in an independent manner, and with the support of the best jurists of the world. As I have asked recently in my response to Mahinda Rajapaksa, why would we, a country of the Global South deprive ourselves of the expertise of our brothers and sisters in other countries of the Global South? Why not reach out to the Argentine experts who have identified the fate of the missing in their native country and around the world? Why ignore the contribution of our Tunisian friends who have examined the corruption and human rights violations of their past dictatorship? Why slam the door on South African lawyers who are even now uncovering the horrors of Apartheid and contributing to the construction of a diverse, proud Rainbow Nation, as they call their beautiful country? Why ignore the know-how of Colombian experts striking the delicate balance between peace and justice after a long conflict? Why shy away from even asking High Commissioner for Human Rights Michelle Bachelet who has been a torture victim and later a Defence Minister and the President of her country to share her own experience in these matters with us? * We have the expertise of numerous Sri Lankan experts who have participated in courts around the world. We have the recommendations of thousands of Sri Lankan citizens who appeared before the Lessons Learnt and Reconciliation Commission as well as the Consultation Task Force to give recommendations about justice. We have the willingness of the best legal minds around the world to share their opinion and expertise. * The Resolution also encourages the return of land to its rightful civilian owners. This is quite a self-evident task: once the defence imperatives are addressed, there is no necessity to use the land of civilian owners. We are a nation of laws, and every Sri Lankan, no matter their background and state in life has the right to own property and make a living, however modest. And, as the High Commissioner has noted, we are making significant progress in this regard. Who could be against ensuring that someone recovers a house, a plot of land, a fishing ground, so that everyone can enjoy the simple happiness of building a family, working hard, dreaming of a better future? * The Resolution also encourages the Sri Lankan government to introduce effective security sector reforms as part of its transitional justice process, which will help to enhance the reputation and professionalism of the military. Who in his or her right mind would want to deny the military of the opportunity to enhance its reputation and professionalism? Can those who call themselves patriotic really deny the military the opportunity to serve the noble cause of peacekeeping around the world? Ten years after the end of the conflict in the North and the East, 30 years after the end of the second insurrection in the South, we seem to continue those fratricidal conflicts in our hearts, with the anger of the fighter, instead of the compassion of the peacemaker and peacebuilder. Instead of using the capacities of the state to rebuild, reform and reconcile, we try to stop rebuilding, reform, reconciliation and healing. Instead of recognising the inherent human dignity of all persons, we ask first for their language, their religion, their identity! The sad reality is, then, that there are those who oppose any measure to achieve accountability and reconciliation, because they do not want justice. They want victor’s justice. They do not want the peace of the living, they want the peace of the cemeteries. They calculate that by appealing to our worst instincts: by mobilising the base emotions of fear and hate, they will grasp power. In 2015, we ceased to be the ‘pariah’ nation we were in the period immediately before that where we were fighting everyone and cornering ourselves. We took control of the accountability and reconciliation agenda, and we put the world as our witness. Nothing less, as I have said, and nothing more. We regained our place as a responsible sovereign nation alongside the rest of the world, because we had regained our heart, and our identity as a compassionate, proud, diverse nation, full of hope and inspiration to march forward, holding our heads up high, to be the best that we could be.